The Alexanders: Happy Anniversary to Us! Tomorrow my honey and I will have been married for 7 years! It seems like a long time, but I can still remember those dating years and my wedding like it was yesterday. On the other hand, I can hardly remember a time without Craig in my life. Thank the Lord he sent me this wonderful man to be my husband and to father my children. He is so good at both and I love him so much! What a beautiful couple you make! 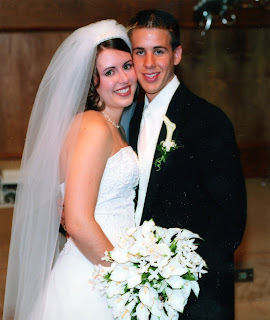 Happy Anniversary, may God bless you with many more happy years together! Catching up on your blog! Congrats - I knew it was around ours. Our 5 year is tomorrow - time flies when you are having fun!